Plaster casts of Vesuvius’ victims restored. Some fascinating work taking place here which I thought my fellow bloggers would like to read about. There was now an intermission and during the break many of the performers were strolling around the traders’ stalls, including the American Union and Confederate soldiers already dressed in their uniforms, carrying musket rifles, powder flasks, flintlock pistols, and pouches for the lead shot. They looked very impressive and anxious to get into the arena to re-enact the American Civil War. While this re-enactment was taking place I took a stroll around the civilian quarters where ladies were busy repairing soldiers uniforms from the previous day, they were also baking bread, making biscuits, and preparing the evening meal for the soldiers. Of course they had to attend to the wounded as well as looking after their children. This was a hard life for the wives of these soldiers; they knew their loved ones had a good chance of being wounded then and now.. Many wars had been represented over the weekend, some not mentioned here, but all extremely professionally re-enacted . These are either The Yorkists or Lancastrians. .
Sunday was the final day of this spectacular show at Kirby Hall and World War Two was the last re-enactment to take place. Now all the soldiers dressed in their Khaki uniforms were beginning to form ranks ready to give drill and military displays. Some were checking army vehicles and preparing them for battle. Huge trenches and bunkers had been prepared as well as fortifications. The British and German regiments and officers’ ranks were well represented; they looked extremely smart in their uniform as did the American forces and some of their female staff. As we watched the soldiers take up their positions , we could hear comments from some of the spectators ,one gentleman saying that our soldiers are carrying the Lee Enfield 303 rifles and light machine guns. This gave friends and family an opportunity to bond and chat about what they were seeing. There was an enormous explosion to signal the beginning of the battle. Next there appeared in the skies the Spitfire aeroplanes , the Hurricane and the German Messerschmitt demonstrating a dog fight air battle. This was very exciting, especially for the kids who thought it great fun. Of course they had no idea what tragedies had occurred during that bloody war. Away from the military area, we came upon ‘civvy street’ during the war years. The first thing we noticed was what was commonly know as the spivs, looking every bit the part and walking around with that well known swagger trying to sell black- market goods, ranging from sugar, butter, clothes, silk stockings and bed linin. These and many other items had been on ration or restricted during the long years of the war. These re-enactors were dressed just as I remembered, conspicuous indeed theirs suits having enormous padded shoulders, the jacket lapels being very wide, and bright gaudy coloured ties, sometimes with a picture of one of the famous film stars printed on them. They also wore trilby hats, black and white shoes, rings on their fingers, and sometimes an ear ring in one ear. Their hair was sleeked back using loads of Brylcream , making their hair look shiny. These sauve guys were walking down the street with an accentuated swagger. Most housewives would be grateful for these black-market items, but on other occasions, the spivs would be told. “goo on weya”, or ” shuv off’ “we don’t want to end up in clink”. Their reply was usually ” O.K., please yerself darlin, but I bet yowd like these nylons wouldn’t ya?” Of course that would be a different kettle of fish, and the women would soon change their mind about that and buy as many pairs of nylons the spivs would let them have. John and I returned back to our stall after having a short break to find a couple of these spivs waiting to buy our sauces. Of course they had to act out their role by saying, How about a few jars cheap from under the counter, luvvie.” I decided to play along with these spivs , as they were gaining an audience around the stall which was good for business. I got into character saying, ” Goo on we yer” now don’t be cheeky. Ive’ gorra mek a livin as well as you yer know. Anyway who yer gonna sell em to after?” “Well thaim sweet aint they” said one of them. So the ladies will buy em to spread on the bread and scrape for the kids, or dip the babies dummy in em. That’ll shut em up. Goo on, Mrs, lets av a few jars cheap if only to shut them babies up so as their mums can av some peace ” 0h alright,,” I said ” how many do yer want. “Give us a baker’s dozen, darlin, but charge us for nine,” “You’ve really gorra cheek you guys, “I said. But O.K. Upon that there was a tremendous uproar and cheering from the crowd which had gathered and were listening to the banter. Once the military displays had finished, the soldiers who had come from all over the world and had taken part in the show mingled around the stalls buying items to take back to family and friends. They talked to the spectators and laughed with the children who wanted to try on the German helmets or sit on the motorbikes and have their photo’s taken. The sense of community was wonderful and made me feel proud to have been part of this show. This Living History display of World War Two was indeed spectacular. It brought back many memories, no doubt, for some of the visitors, myself included, who had remembered the air raids on London, Birmingham Coventry, and Liverpool, hearing the sound of the sirens and of the English and German fighter planes, seeing the armoured vehicles, the British, German and American regiments. Everyone was also able to hear exerpts from the radio shows of the time, such as, Itma, Band Wagon, Much Binding in the Marsh and many of the big band sounds. This History in Action Multi-period event staged by English Heritage was now coming to a close but not before the grand parade. There was now complete silence as people waited. Suddenly there was a loud flare of trumpets as the cavalry through the ages began, followed by the military vehicles which had taken part in the world war two show. There was then a tremendous cheering as the Romans appeared leading the infantry contingent. 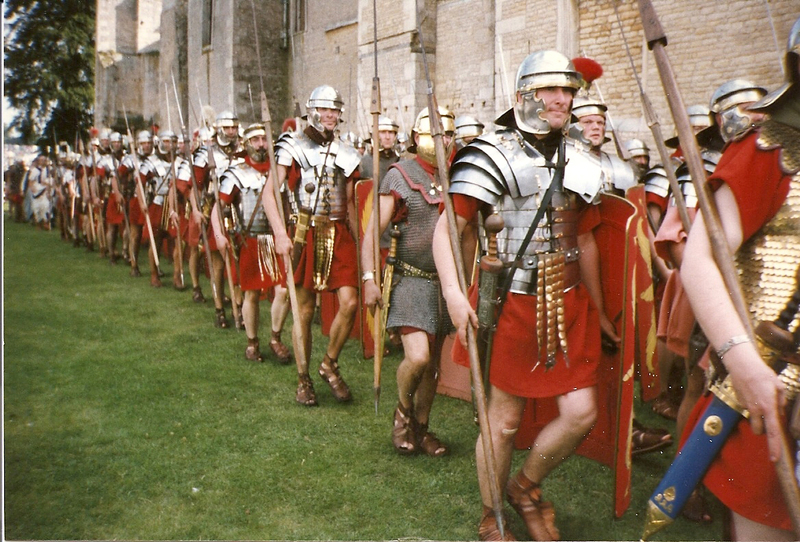 As the legions marched past, you could hear the clinking of their armour and witness the colourful red tunics, the chain mail and javelins, the colourful plumes upon the centurions helmets and the aquifer (standard) of the legion, which had to be defended at all cost when in battle. 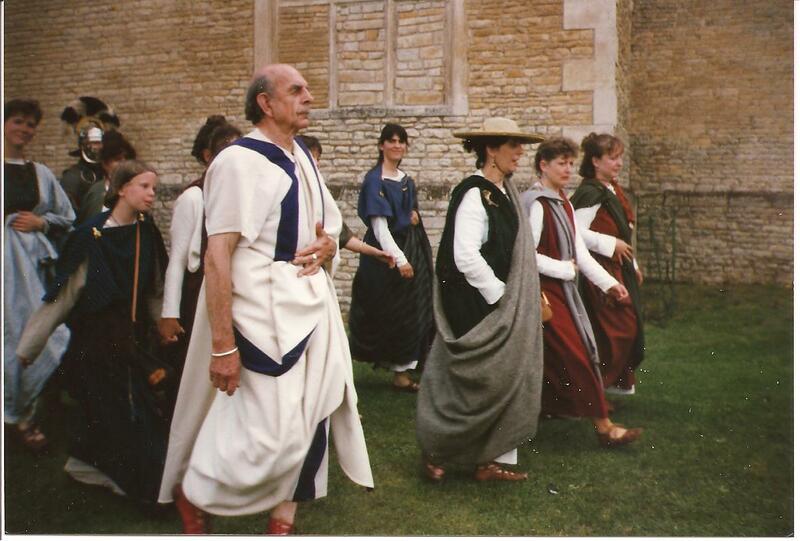 Following the Legions, came the Senators in their togas and their wives looking exquisite in their dresses of varying colours. They looked every bit of the style of the times with both clothes and hairstyles . 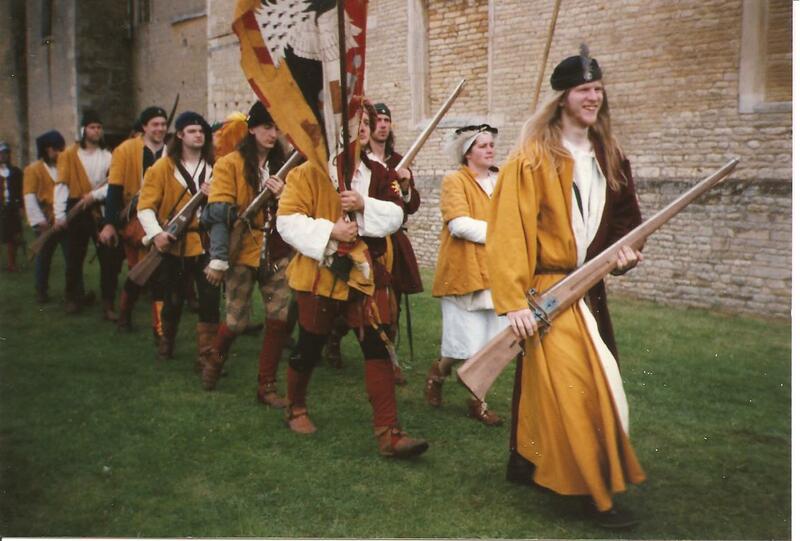 Many hours had been spent by the re-enactors themselves making these costumes. Now the Celts began their march past; the woman wore their colourful woolen clothes, and the warriors’ bodies were painted the colour blue, called woad, and gold. Some had their hair tied back in a pony tail; others had combed their hair sideways and tied it into a knot, they had long moustaches which almost covered their mouths.. They wore the well- known torc around their necks and carried fearsome weapons. They certainly did look terrifying. There was loud cheering from everyone for their appreciation for their display when in battle. After a short break at my stall serving those who were wanting to purchase the last of our sauces, before the show ended I managed to get back to the parade in time to catch a glimpse of the Medieval soldiers and the jousting knights, again being very colourful and every one cheering as the Lord and his beautiful lady rode past on their magnificent horses; the knights carrying their lances, looking very chivalrous; followed by the ladies whom, no doubt, they had fought for and appearing in all their finery of these Medieval times. The peasant who followed were noe looking very weary. They had made their own garment from the very cheapest grade of wool. These peasants could never afford the better quality wools, silks, and satins that the rich people chose. The rich could afford tailors and seamstresses and have their clothes trimmed with fur or velvet. I felt very sorry for the peasant of these times, but we were all cheered up by the musicians playing their flutes, tambourines, and drums, along with the jesters and acrobats . 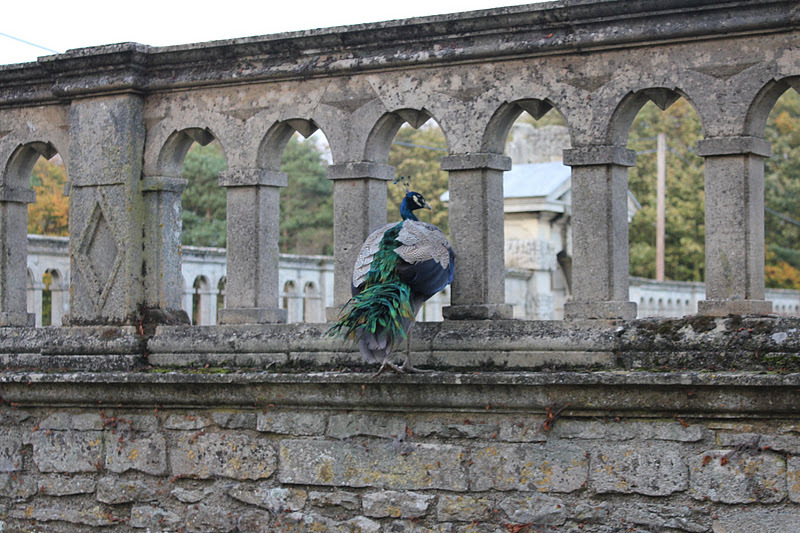 These were followed by the Falconers and their birds. There had been still other battle displays from different time periods which had been re-enacted, but these were still to follow in the grand parade.. Unfortunately we and the rest of the traders had to begin packing our entire gear ready for the journey home. However we were finished just in time to see the beginning of the World War Two procession. Our soldiers in khaki and the Woman’s Royal Air Force in blue uniforms proceeded to march past. The German soldiers were wearing their grey uniforms came next, some on foot some on motorbikes, were followed by American Troops. The women in their blue uniforms, again some on foot, some riding in jeeps. Everyone was cheering the soldiers, especially the women soldiers who were flashing their nylon clad legs; wolf whistles coming from everywhere. The Spivs and their girl friends followed . Just as the procession finished Howard Giles our commentator, announced the memorial fly past of the Hurricane, the Lancaster bomber, the spitfire and the German Messerschmitt . This was fantastic. What a finish to an absolutely great weekend which had begun with pouring rain. Now nobody wanted to go home least of all the children who were crying telling their mums they wanted to stay and see more. 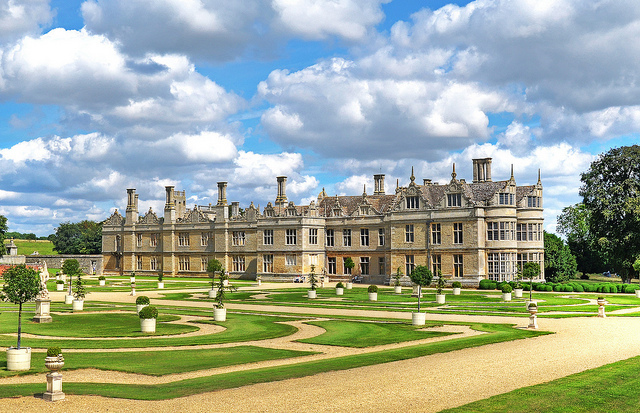 Below are photo’s of Kirby Hall which was magnificent in its hay day. Kirby Hall in its hay day. At the end part three of the above title post, you may remember that we were at the Tewkesbury battle Re enactment talking to two of the market stallholders Gracia and Pete whose ancient incense aroma’s intoxicated us all. So to continue with the Tewkesbury event. Everyone had been busy since 7-30 that morning putting up tents and setting stalls ready to display their wares and finally donning the appropriate garments. It was now 10-30 and the public were arriving. We had already met quite a number of them who had come back to purchase more of our sauces, much to our delight. They seemed so interested in foods of past times and this allowed for easy general conversation with many of our customers. Some of them remarking how much more work and preparation had to go into meals during earlier times., Todays foods , on the other hand, are far more easy, so the modern generation is losing interest in cooking for themselves and go out for many of their meals. It was now 2-0’clock and time for the Battle of Tewkesbury to commence. The public gradually moved away from the traders to watch. Some of the children had come dressed in their Medieval outfits made by their parents. The children looked adorable in their costumes, pretending to be Knights in shining armour. They had been fighting with each other most of the morning and were now anxious to see the real thing. 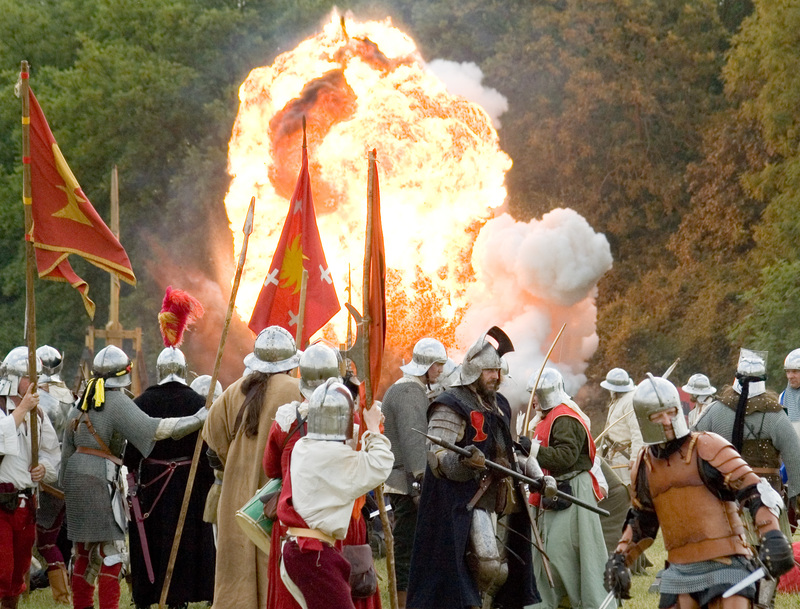 We could hear the crowds cheering while the battle was being fought between the Lancastrians and the Yorkists. It seemed to go on for some time when suddenly there was an almighty thunderous bang which was the firing of the cannons followed by cheering and shouting from the spectators. These cannons had been hired especially for this event; obviously only black powder was allowed to be used. We were unable to see the battle ourselves as we were serving at our stall , but it was related excitedly to us step- by- step once it was over. People were saying how realistic it was. The children got so excited trying to explain that the soldiers had let them join in the fight using their replica wooden swords. Many of them were arguing with one another as to who had killed one of the enemy and who hadn’t. It was followed by another battle that required their parents to break it up. 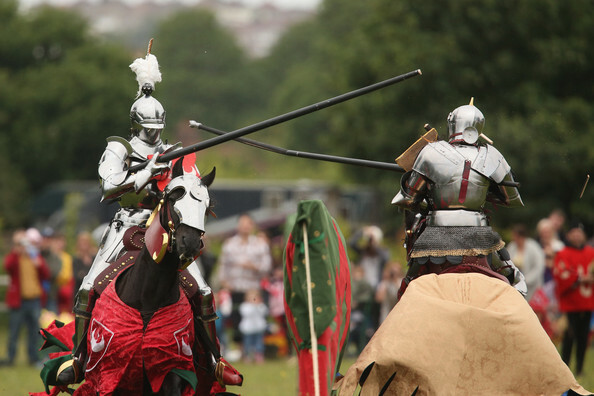 At these events the public learn about many things of times past, for instance, The soldiers explained what a knight had to endure, especially during the 15th century, when full plate armour was introduced, weighing approximately 50 lbs ; including the hand sword, bow and arrows, crossbow, battle axe, mace dagger, and lance. Chain mail was used prior to the development of suites of armour and then worn in conjunction with the armour. My immediate thoughts were for the Knights who had to bear the weight of so much metal. These suits of armour had to be made to fit the knights exact measurements; otherwise it could endanger and hamper the knights ability to fight. A full suit of armour cost an enourmous amount of money. Many of the re-enactors made their own suites of armour, spending hours upon hours making the metal links used to make the chain mail. They even made armour for their feet called ” Sabatons; ” this footwear consisted of riveted iron plates on the boots, greaves for the protection of the calf and ankle, plate armour for the kneecap , armour called ‘ cuisses’ to protect the thigh. spurs to encourage the horse in battle. There was even armour to protect the armpits and also the upper and lower part of the arm. They made ringed metal plates which went over the fingers of the gloves gauntlets . There was also the breast plate, the back plate, and the detachable visor which protected the eyes and face. 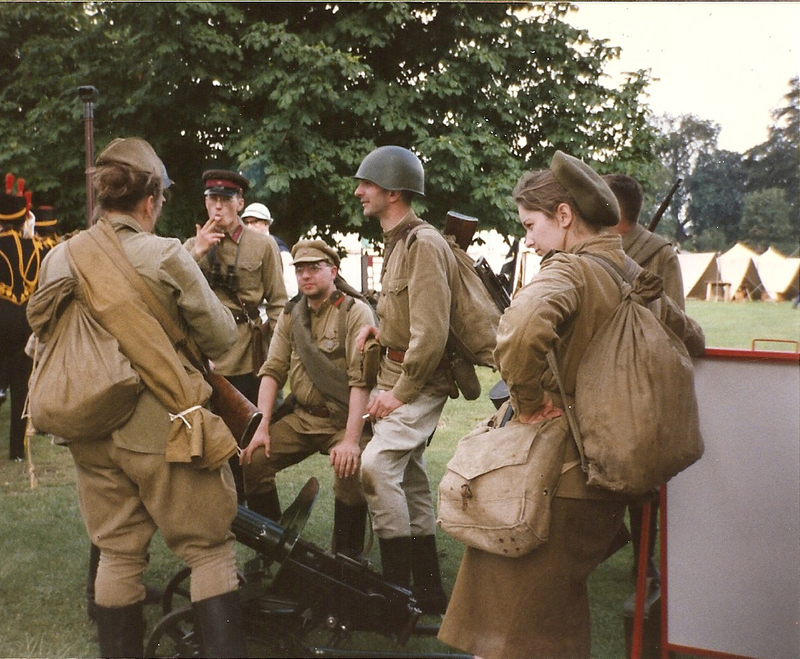 My thought were, and still are that these re-enactors are dedicated people willing to work so hard sometimes right through the night to achieve perfection and reality to their cause. The Knights weapons consisted of a dagger called a roundel, and sword; these were attached to the belt. They carried a shield for defence, it also was decorated with the knight’s heraldic blazon and thus served also for identification. Spikes called gadlings, were fixed to the knuckles of the knight’s gauntlets. These knights had to be sworn in by sacred oaths of conduct combined with the ideals of chivalry and strict rules of etiquette . There were even strict rules of courtly love practiced during the Middle Ages. It was common occurrence for a knight to accept a token from a lady, such as a scarf, to be worn during a Medieval tournament; this was true of several knights who participated in the re-enactment .Much to everyone’s delight, there was much cheering and clapping for more of this romantic gesture, from grownups and children alike. Many of our customers said they understood where the saying “My Knight in shining armour” came from. They were so courteous in those days towards the ladies. 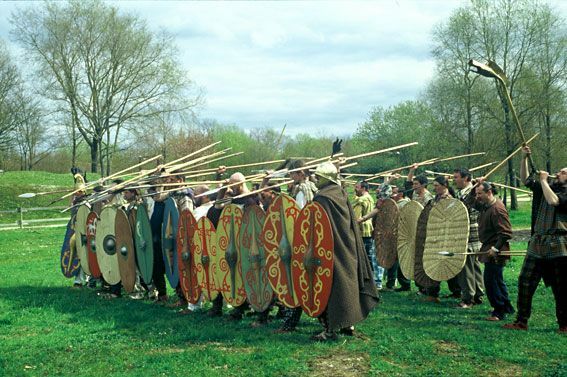 This had been the first of many of these events, too numerous to relate to here and much on the same line with the traders markets, and the different battles re-enacted, on the original sites where they had taken place. But there is the grandest one of them all which I always like to relate to as it was so spectacular and covered all periods of time and that is Kirby Hall in Northampton England. and staged by English Heritage. Our journey to Kirby Hall had been hazardous to say the least, due to heavy rainstorms that made our arrival a little daunting. We arrived on a Friday; which was the norm; everyone had the usual time to set up stalls ready for Saturday and hoping of course that the rain was going to clear. We all gathered together that evening for the usual drink and gossip in the beer tent, catching up with each other’s experiences and different event people had seen. During that evening, to John’s and my amazement and dismay, the rain had not ceased at all and was pouring down relentlessly When we awoke the next morning around 7-0’clock, to see that most people had set up their stalls on Friday ready to display their wares. Some, like us, had even placed their goods out to save time. Still pouring with rain John check that everything was o.k. with our stall, but came back to the caravan saying’ that this event was going to be a complete washout; nobody is going to turn out in this awful weather. This is one of the joys of Re enacting situations, i.e. relying on the weather. Many of the tents had leaked making the insides soaked and everyone worried that whatever had been put on display to sell would get wet. I felt especially sad for one stallholder who had some beautiful 16th and 17th century dresses she had set up. These had taken weeks and weeks to make, and the wind was driving the rain inside where these costumes were so well displayed. It turned out that some of them were only wet at the bottom of these dresses. Some of the labels on our Apicius sauces had peeled away from the jars but we were able to wipe them dry and replace the labels . Once we had had our breakfast John decided to go and take down the tent saying, ” I think its going to be a waste of time.” ” Well, lets wait a little longer,” I said, ” It might clear up later. ” We waited until around 11-0’clock and as we hadn’t heard anyone else venturing out again after previously finding everything in such a mess, we sauntered around to where our stall was. We were absolutely stunned to see queue upon queue of people dressed for this horrendous weather in raincoats, hats and wellingtons. They were carrying umbrellas, and many had waterproof bags in readiness for whatever they were to purchase. It was obvious there was no deterring these dedicated people from this already popular show.. Suddenly everyone, including traders and re- enactors , threw up their arms with a loud cheer. The customers shouting, “Come on, then you lot open up and lets begin the fun.” So the day began with us anxious to serve these people who had so gallantly turned out in such appalling weather supporting this truly historical event. 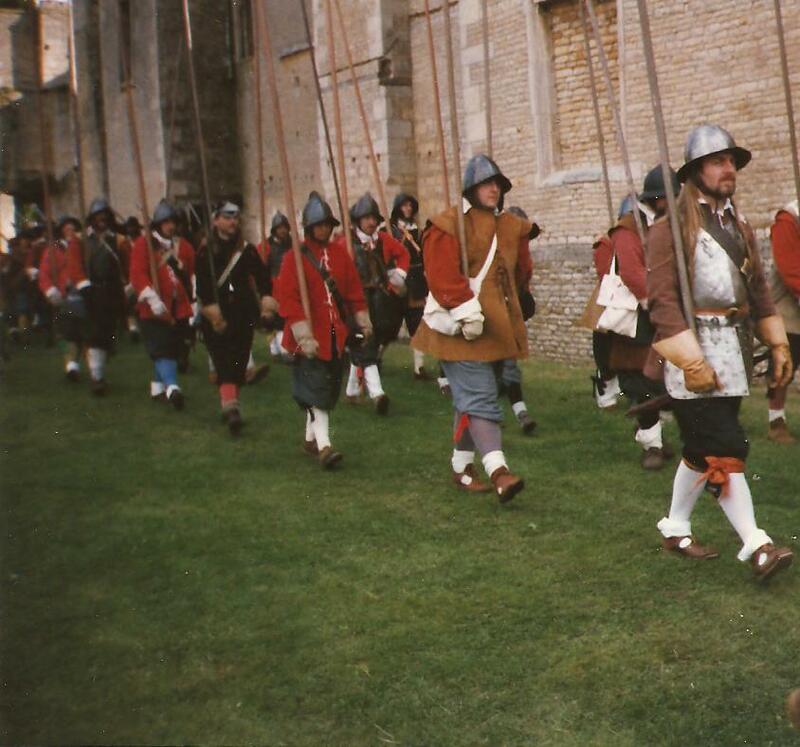 The people who were to take part in re-enacting the battles were busy getting prepared, checking all weapons such as, swords, daggers musket rifles, pistols and armour. The soldiers were checking each others uniforms, making sure all buttons were attached, medals and boots had been given that extra polish, and the World War Two guns and tanks had been placed in position. The horses which both soldiers and jousters would be riding, were becoming restless and needed to be calmed. It continued to rain on and off for the first day of the show, which was very unusual for the month of July. However, despite this our sauces sold extremely well. One reason for this was because our medieval tent was so large that a number of people could come right in out of the rain.As the day wore on we were selling fast and furious and beginning to worry if we had brought enough of our product to keep us going until the end of the show. While serving customers, they had explained how exciting the battles had been even though it had rained in between a few of them. One battle had taken place between the Celts and the Romans ; the children told us that the Celts looked even more vicious because they were all wet and covered with mud so the paint was all streaky and running down their faces. The Romans also were the worse for wear, as their costumes and sandals were soaking wet. This made the fighting very difficult as they were slipping and sliding everywhere. Needless to say both sides stood their ground. The atmosphere was electrifying . When it had finished there was much cheering and shouting especially from the children, they wanted more. The battles which were to take place on Sunday were the English Civil War between the Royalists and Cromwell’s Roundheads fighting for the crown. The Wars of the Roses between the Yorkists and the Lancastrian, both being spectacular in costume and combating on foot or horseback was also on the schedule. My favourite part was seeing everyone getting ready to go out onto the Arena and watching thousands of performers from all over the world take part as they accurately portrayed those battles. It really is something special, and the buzz it gives is invigorating. Stay tuned for part five. The Archaeology News Network: Traces of flowers placed on Palaeolithic grave found. For those of my blogger friends who have been following my progress with the Linear B Ancient Script writings, know that I am now moving on to the University Level online with my studies. My teacher Richard Vallance, has assigned me several of the Linear B tablets dealing with Military Affairs which I must say I am delighted to have the opportunity to be able to translate, as this subject is a favourite of mine. Not only that, we are delighted to announce that Linear B Knossos & Mycenae reached its second anniversary on May 1st So what have we accomplished in the past two years? A great deal indeed. The following are some of the highlights. 1, The discovery, extrapolation, collation and classification of SUPERSYLLABOGRAMS in Mycenaean Linear B, of which there are 34 ( to date ) out of 6l Syllabograms in Linear B , excluding counting Homophones ( with the sole exception of RAI – saffron . 2. We have entered into close partnership with The Association of Historical Studies, Koryvantes ( Athens, Greece ) where we have been assigned our own category for posting on their blog. As a result of this Richard has been invited to give a lecture at the conference ” Thinking Symbols” ( June 30th – July 2nd 2015) Sponsored by the Association of Historical Studies (Koryvantes), Athens. at the Pultusk Academy of the Humanities just outside Warsaw. While Richard is there I have to get on with my Linear B Military translations.